These pH paper test strips were made using paper coffee filters that had been cut up into strips and dipped in red cabbage juice. The strips can be used to test the pH of common household chemicals. 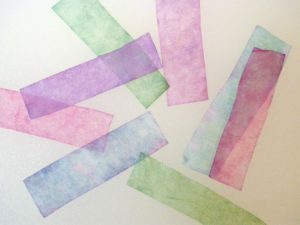 It’s easy to make non-toxic pH paper test strips from red cabbage juice. This is a fun project for kids to do at home. If you calibrate the test strips, they are useful for a school lab. Basically, all you need is a red or purple cabbage, a way to cook it, and some kind of absorbent paper to absorb the pH indicator and make strips. Cut a red cabbage (or purple) into pieces such that it will fit into a blender. Chop the cabbage and add the minimum amount of water needed to blend it. If you don’t have a blender, then use a vegetable grater or chop your cabbage using a knife. Microwave the blended cabbage until it’s hot enough to see the liquid boil or steam rise. If you don’t have a microwave, you can cook the cabbage on the stove. Another option is to place the cabbage in a sealed plastic bag and place the bag in a pan of boiling water. The goal is to cook the cabbage enough that the plant cells burst and release the pigment inside them. Allow the cabbage to cool. Filter the liquid from the cabbage through a filter paper or coffee filter. It should be deeply colored. One way to use the cabbage juice is to add a few drops to a small container of a liquid. One problem is that the juice is so dark it can be difficult to read the result. Also, you need to freeze leftover liquid. Test strips solve both problems because they are easy to read and can be stored at room temperature until you’re read to use them. Soak a filter paper or coffee filter in the red cabbage liquid. Cut the dry colored paper into test strips. Use a dropper or toothpick to apply a little liquid to a test strip. The color range for acids and bases will depend on the particular plant. If you like, you can construct a chart of pH and colors using liquids with a known pH so that you can then test unknowns. Examples of acids include hydrochloric acid (HCl), vinegar, and lemon juice. Examples of bases include sodium or potassium hydroxide (NaOH or KOH), detegent, and baking soda solution. You can use pH paper as a color-change paper. You can draw on pH paper using a toothpick or cotton swab that has been dipped in an acid or base. If you don’t want colored fingers, soak only half of the filter paper with the cabbage juice, leaving the other side uncolored. You’ll get less usable paper, but you will have a place to grab it. Many plants produce pigments that can be used as pH indicators. Try this project with other pigmented fruits, vegetables and flowers. Blueberries, rose petal, turmeric, and red onion are excellent choices.